March is Women in Jazz Month, a time to celebrate the contributions of women to jazz. As a lifelong activist, I want to celebrate the role that women in jazz played in paving the way for the Civil Rights Movement. While Billie Holiday’s “Strange Fruit” is well-documented, Ethel Waters’ “Supper Time” is not well-known. Written by Irving Berlin especially for Waters, the song is about a wife’s grief over the lynching of her husband. I also want to hihglight the pioneering women of the International Sweethearts of Rhythm, the first racially-integrated all-female big band. 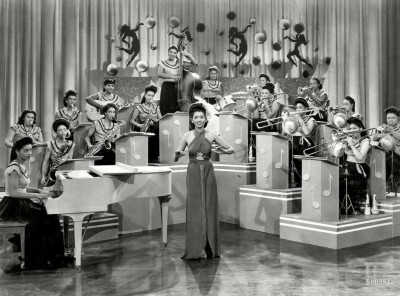 The 17-piece band was led by vocalist Anna Mae Winburn. The Sweethearts were popular in the 1940s. Indeed, they were one of the top swing bands, appearing on radio broadcasts, and touring the U.S. and Europe. The group disbanded in 1949.